I feel an overwhelming need to message you with such heartfelt thanks! 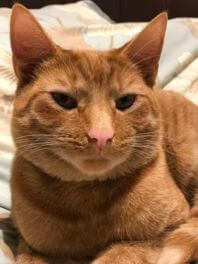 My baby boy, Buddy, is a one-year-old ginger tom who we rescued from Cats Protection, along with his sister Sox, when they were 3 months old. Buddy has always been a shy little boy, finding life quite stressful. A fortnight ago he had an accident which will mean that he will have to have his tail amputated and so along with the trauma of the accident and the subsequent pain he has been in, life has been pretty dreadful for him. He has spent the better part of the last 2 weeks under my bed, not even coming out to eat. He has lost weight. I have been laying on my side talking and stroking him and bringing his food upstairs! On Friday, while arranging Buddy’s operation, I told my vet how worried I was about him and she recommended that I try FELIWAY. We ordered a starter kit which arrived on Sunday and I plugged it in immediately. This morning, Monday, he jumped on the bed to say hello, he played with our dog and was much more himself. This evening, he jumped on my lap, padded around and finally fell asleep with me, which he hasn’t for what seems like an age, so lovely to see him, almost himself again. 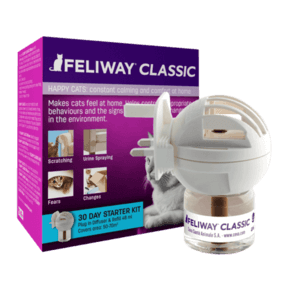 I absolutely can’t thank FELIWAY enough and I am totally sure that with the help of Feliway, he will recover from his operation and may even go on to be more confident and comfortable than he has ever been.